Homemade thank you gifts don’t have to be complicated, expensive, or time-consuming. Check out this easy thank you gift idea using donuts and cinnamon rolls from your local grocery store’s bakery department case. Cookies or mini brownies would work well too. An assortment of baked treats from your local grocery store’s bakery. 1. Place the styrofoam block into the gift box. 2. Cover the top of the styrofoam with decorative shredded paper. 3. Thread each donut onto a cookie stick. Add a few donut holes onto some of the sticks. 4. Insert the cookie sticks into the styrofoam, arranging them in the shape of a bouquet. 5. Add a personal note of thanks or a thank you gift tag. Viola! 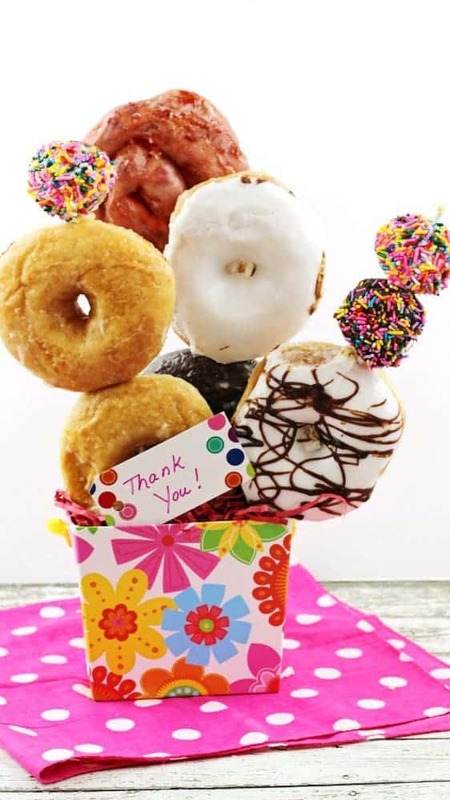 One thing I love about this easy homemade thank you gift idea is that you can make several donut bouquets without taking up to much time or spending a lot of money. 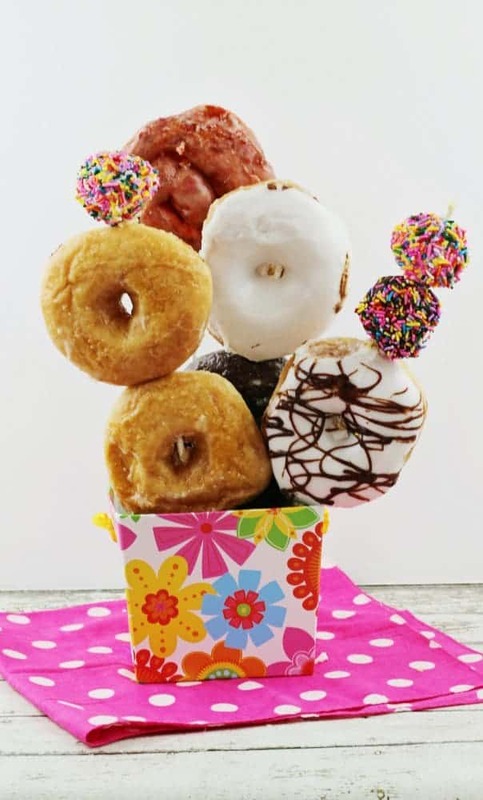 A donut bouquet is also a perfect thank you gift to bring to your doctor’s office or other group setting. If you’re taking your gift on-the-go, you can either wrap each skewer with a party bag and twist tie, or simple cover the entire bouquet with a cellophane gift basket wrapper. I’ll be gifting our sweet MOPS leader with this special DIY thank you gift to show my appreciation for all she’s done for us over the past year. Ashley is famous for her sweet tooth (and completely unashamed of it which I love about her) so there’s no better way to say thanks to her than with a sweet treat from the local grocer’s in-store bakery department! You can get more inspiration here on Pinterest or here on Instagram. Three Sweet T Makes Three readers will each receive a $25 Visa gift card! Mandatory entry: Leave a comment telling me about a special person in your life that you’d like to surprise with a gift from the local grocer’s in-store bakery department. Giveaway ends 10/20/16 at 11:59 PM CDT. I will use the “And the winner is” plugin to randomly choose 3 winners who will have 48 hours to respond to their winning notification before another winner is chosen. Giveaway is open to US residents only. Allow 6-8 weeks for prize fulfillment. This is a partnered post. All opinions are my own. I’d surprise my kids, they are so well behaved and I am proud of them. I would surprise my husband because he supports every crazy idea I come up with….including running in a half marathon with me. I would love to surprise my Mom with a gift, she is very special to me and so many people. A special person in my life that I’d like to surprise with a gift from the local grocer’s in-store bakery department is my older sister. She’s been through multiple surgeries this past year and experienced infections. She could use a little uplifting gift to know I’m thinking about her! I would like to surprise my husband because he is such a good provider and is always there for me helping me with everything, and is so loving and encouraging to me and the kids. This would be a fun idea for my sister. She stays busy with work and doesn’t have time to bake a lot herself. I would love to surprise my two little nieces with a donut treat. 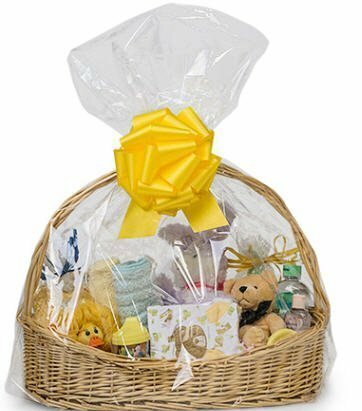 Id love to do something nice for my mother-in-law that helps us endlessly with our little ones! I would love to surprise my husband with a special treat. Our 30th wedding anniversary is coming up and he is the best so he deserves this and way more! I would surprise my daughter. I would love to surprise my husband. He does so much for me. I would like to make this for my friend, She always does lovely things for me and everyone else. I would surprise my daughter. She is relentless in ensuring that I am able to go places when my car breaks down and spends lots of time making me smile. I would love to surprise My Aunt & Uncle, my son is in college in Fl and had to evacuate due to the hurricane. They took him in and his 2 roommates I owe them something nice!! I would love to surprise my best friend with a treat from the bakery. She and I love sweets ;). I would love to gift to my mother in law. She is the cooker in the family and I could gift her some serious sweets. yesterday I would of said my hubby of 43 years, but not talking to him today so would have to say surprise my daughter and grandaughter especially grandaughter for her 4.0 grade senior year. I would like to treat my hubby. He works so hard for us and deserves a special treat. Thank you! My daughter because she is such a joy and delight and loves to have surprises. I would love to surprise the grand kids with goodies from the bakery! I’d like to surprise my mom! She works hard and deserves a surprise like this! I’d love to surprise my husband, he’s an amazing partner, friend, and father! My husband is very deserving of this surprise, because he has to put up with me! I would surprise my dad who is 93 years old and has done so much for me during my 52 years on this earth. I would love to surprise my mom! She is is so sweet and always doing nice and thoughtful things for me and my family. I need to do a better job of doing things for her as well! I would like to give it to my mom. I would surprise my mother. She is 81 and just recently lost most of her sight, and this has saddened her greatly to lose her independence. This is such a lovely and sweet (easy) idea, that would make anyone’s day Brighter! Thank you so much for sharing, and I will definitely be making this. I would love to gift my mom with some delicious sweets. She has the biggest sweet tooth of any one I know. She loves something sweet after a long day at work. I would love to treat my FIL. He just had surgery and could use a pick me up. i have to go with my sister. she just got her first big girl job. proud of her! I’d like to surprise my niece who is the sweetest person in the world and has gone though some heartbreaking things lately. Oh I would love to surprise my sister. Her son has very low functioning autism, and she is homebound with him as he cannot be left alone for even a few minutes. She has dedicated her life to caring for him, and does such a great job. She gets out of the house a couple times a week to run to the grocery store…but that is all. I think this would be wonderful for her! I would love to surprise my husband. He always picks me up special treats and it would be great to do it for him in return. Thanks for the chance to win! This is a great idea and seems so easy! I would love to make one for my sister, who has been sick lately and sure could use some cheering up! My husband would like it. My two daughters who left for college this Fall. They would love this!! I would love to surprise my hubby -he’s been our family rock, thru good times & bad!! I would surprise my friend Mary Ann with some bakery treats. I would love to surprise my mom for all that she has done for me! She loves me so much and I want to show her some kindness. I would love to surprise my hubby with something from the bakery! !~ He’s such a hard worker & rock of this family!! I’d surprise my best friend because she’s always there for me. i’d like to suprise me mom! i love this idea. i would love to surprise my husband with a gift from the bakery department. he loves sweets and we have been avoiding them because i am trying to lose weight but he doesn’t need to lose weight so i would love to surprise him with this. I would love to surprise my co worker. She is always helping me out. I’d love to surprise my mom with a treat from the bakery. She helps me out so much and I appreciate her! The special person in my life that I would like to surprise with a gift from the local grocer’s in-store bakery department would be my father in law who is always available to help with family stuff when needed. I would surprise my kids. They work SO hard at school and I’m SO proud of them! I would love to give my daughter a gift. She’s in college and working and could use a pick me up gift. I would love to surprise my kids with a nice treat. I would surprise my kids. They love treats. I would surprise my husband as he is all the time surprising me with special treats. I would like to treat my son’s father’s mother to something special she works long hours and just deserves a moment! My husband is very special to me and deserves a treat from the bakery. I would like to surprise my husband because he works so many long, hard hours for our family. I would surprise my mom. I just love giving her stuff, she is always so appreciative. I would surprise my Mom for doing so much for us, she would love it! I would love to surprise my sister with a gift from the local grocer’s in-store bakery department because she was the one who sponsored me to the US, and helped me a lot! Thank You for the great chance! My son, because he has been recovering from surgery and he is awesome! I like to surprise my mom which is also my best friend. I would surprise my neighbor (and friend) across the street – she is exhausted from a recent work trip and deserves a treat! I would love to get it for my sister. She works so hard and has a sweet tooth. She would love it. I would surprise my mother. She is a wonderful grandmother/mother. I would love to surprise my husband! We just celebrated our one year wedding anniversary on Monday! i would love to surprise my dad. He’s done so much for me, and is so hard to buy gifts for. He does have a sweet tooth though, and would really love a gift basket filled with yummy treats. thanks for the chance! I’d like to surprise my husband because he’s had a stressful time at work lately and he could use a pick-me-up. I would love to surprise my Mom. She is always there for everyone – it would be great for her to be on the receiving end of a surprise. I would love to surprise this to my son, he is a hard working man that works 40 hrs a day, then comes home and has a business at home that he then works most of the rest of the day, but still has time for his wife and his 4 children all under 8 with another one on the way in Feb.
I’d love to surprise my oldest daughter. She’s a full time grad student who is also working part time. I’m so proud of all she’s done. I would love to surprise my dear friend who just found out she has stage 4 breast cancer. She had been so positive and a huge inspiration to so many and I would love to bless get in any little way I can. Our daughter is expecting their first child before the end of the year. I’d like to surprise her with a small sweet treat. We had our first baby 2 months ago and my mom helped out a lot. I’d like to surprise her to say thanks. I would love to surprise my neighbor and her 4 boys with an afternoon sweet treat. I’d love to surprise my grandma with something special. Her 90th birthday is in a couple of weeks. I would like to surprise my dad. I know he always loves receiving baked goods. i would love to surprise my sons. I would like to surprise my grandparents with a bakery gift when they return home from their mission trip in Africa. I miss seeing them! I would love to surprise my cousin~she needs some cheering up! I would surprise my daughter. Her birthday is coming up soon and she deserves it. I would love this for my parents. My dad was in the Army for 20+ years and we miss the bakeries we would find in Germany. We LOVE Bakery goodies! I would love to surprise my work supervisor! He always does a great job leading our team. I would like to surprise my husband because he works so hard and does so much for our family. My daughter is a high school senior and she is finishing up her college applications. She has been working so hard to get into an architecture school, and not only writing her application essays but also putting together her art portfolio. I’d love to surprise her with these goodies! I would love to surprise my mom and dad. They do so much for my children and me that I would just love to be able to bring a smile to their faces any way I can. 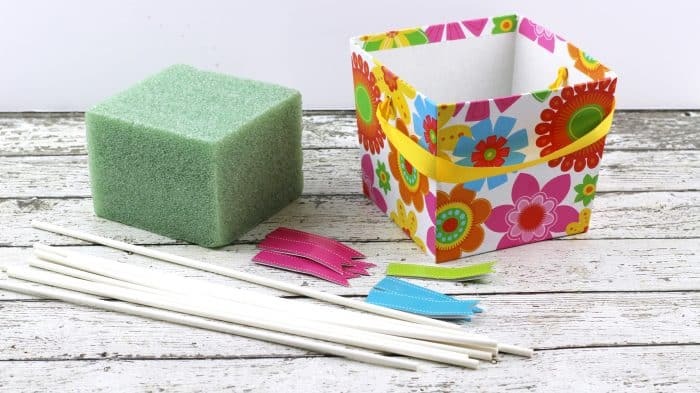 This DIY project looks very easy to do and is super cute! Thanks for the opportunity to win. I would surprise my mom, she’s amazing, my sisters and I love her so much. I would love to surprise my daughter’s teacher! She goes above and beyond and would appreciate something like this! I am grateful for quite a few people right now: My husband, as always,s for his support, and my sons’ teachers (4 of them because last year and this year!) as the impact they make on my kids’ lives has been an enduring and positive force. I would love to surprise my grandson’s awesome teacher. I’d like to surprise my daughter. She is always going out of her way to help me or other family members and her 27th birthday is coming up. I would love to surprise my hubby because he works really hard to take care of our family & deserves a nice treat! This time of year we have a lot of birthdays and anniversaries in our extended family, so there are at least 8 different people or occasions that I could make one for. I’d love to surprise my hubs! He does such a great job making sure the whole family has everything they need and never thinks to do anything special for himself. He has a sweet tooth and would love a bakery surprise! My best friend just lost his dog because it was hit by a car. The driver hit the dog and drove away and my friend saw it all. I think he could use a surprise to help ease the pain. I would love to surprise my daughter and her boyfriend with this fun gift. Adorable! I would love to bring a cute bakery gift to my grand-daughters when I visit. I think they would love this doughnut bouquet. I would surprise my daughter. She is pregnant and has had a horrible time with morning sickness. She finally feels better and a surprise like this from the local grocer’s in-store bakery department would make her day! This is such a cute idea! We have a neighbor who every weeks comes and puts our trash to the curb for us. He mows our yard in the Summer and does so much. He never expects us to pay, we always make him things and always remember him on Holidays. This is such a cute idea to do for him! My kids would love to make it! I’d love to give this to a friend who is currently struggling with health problems. I would like to surprise my friend Tina. She could use a pick me up these days due to some personal issues! I would love to surprise my best friend! She is going through a difficult time right now and I think knowing someone cares and some sweet treats would be at lest comforting. I would gift my son and boyfriend so I can eat some sweets too. We love sharing! I’d love to surprise my husband. I would love to surprise my hubby with a sweet treat. He’s the greatest guy in the world! I would surprise my co-workers with a fun treat!! A fun surprise for the office. 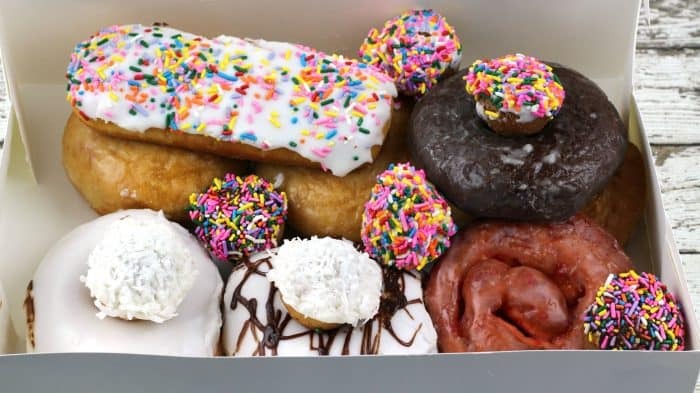 My husband loves donuts, so I’m sure he’d love to be surprised with a bouquet of donuts! They go great with coffee! Id gift it to my friend Rachel who just lost her brother to cancer she needs something seet to make her smile again!!! What a neat idea! I would love to give this to my secret sister. I would gift this to my mom. I would like to see her smile. I would make it for my daughter-in- law who just had a baby! This is a great idea! I think it would be a fun surprise for my kids on their birthday too! But the first person that comes to mind is my business partner. Our business-versary is coming up and she’d love something like this! My mom would love to be surprised with a yummy bakery treat. I would love to surprise my mom with some delicious baked goods. She deserves it because she is always sweet and loving to me. I would love to surprise my neices with this bouquet. They love donuts!! My daughter is pretty special. She’s a great kid. I would surprise my Mom! She not only takes care of my 90 yr old grandma who has alzheimer’s, but she is always there for her family! A special person in my life that I’d like to surprise with a gift from the local grocer’s in-store bakery department is my mother. She has seven kids and 20 grandchildren and makes every holiday special for all of us. I would surprise my kids they mean the world to me and I would love to show them that. I actually think this would make a great gift to surprise my children’s teachers! They would certainly appreciate it, and they really work hard! Cute idea. So cute! I would love to surprise my grandkids with a treat like this! I would love to surprise the teachers at the school I work at for all they do! My best friend was just diagnosed with an autoimmune disease this week. I’d love to surprise her family with something sweet. My mom deserves a great bakery assortment! She loves baked goods, this would be the perfect gift! I would love to surprise my teen! she is a freshmen in college and doing so well! My mom has been really stressed out at work lately. I would love to give this to her. My Mom is the special person in my life that I’d like to surprise with a gift made like this with sweets from my local grocer’s in-store bakery department. She loves their doughnuts and would be totally surprised! She deserves it too, for all the thoughtful ways she constantly gives to others! Thanks SO much! I would love to surprise my mom. She is my best friend, my confidant, the person who can talk me down when I am loosing it. I’d love to surprise my mom and dad for everything they do. I’d love to surprise my husband with this special gift! I would surprise my hubby that works so hard! He looks sweets! I would love to surprise my sister, she deserves this because she is always there for me. She has done so much and has always had my back! I would surprise my friend, Maria. She just got promoted to manager at our local Food Lion. My hubby’s birthday is coming up. His favorite gifts are food-related, so he would love this! I would love to surprise my Mom, she deserves a treat. I would bring something nice to my mother-in-law; who is such a dear and always so friendly and hard working. She needs a break! I’d love to surprise my daughter’s teacher! She’s the best! I would like to surprise my mom with a gift from the local grocer’s in-store bakery department. I would surprise my Husband, he works so hard to take care of his family and makes sure we have a good life. I would like to surprise my aunt because she has done so much for me this year! I would really like to surprise my dad with a gift from the local grocer’s in-store bakery department. He does a lot for my family and deserves the best. I would like to make something for my husband, I know we forget to tell him thank you for being a good hubby, dad, grandpa and a hard work. I would surprise my friend who just lost a job. I would surprise my mom who is going through rough times health wise. She’s a little depressed and I think a pretty gift of sweets would make her feel special. I would surprise my husband, he works so hard. I would surprise my oldest adult daughter. She is having a rough time and has moved back in with me and likes sweets. I would surprise my husband. He has been ill lately and needs cancer surgery soon. This would really cheer him up for sure. I would surprise my pastor -it’s not too late for pastor appreciation! I would surprise my hubby. He loves sweets and works long 10 hour days and even has a second job on the weekends. He deserves it! I would surprise my mom because I appreciate all the advice she has given me all these years. My Son and Daughter, both teenagers. They just lost there grandfather after watching him fight a 2 year battle with brain cancer. They have stayed strong through the stress, and mess that cancer brings to a family. I’m proud of there different look on life, and proud that they realize that life is too short. I would surprise my mother. She is so sweet, and always is doing so much for everyone else! I would love to surprise my mom with some treats! She has always supported me and pushed me to be better and I love her so much! I’d surprise my grandmother. She can’t get out too much anymore and would love that! I would love to surprise my fiancé with some yummy treats! I would like to surprise my dear friend who just had a full term stillborn baby. I’d like to surprise my daughter she is away at college and would love the surprise. My mom could use a surprise. She’s been a little down in the dumps lately. I would like to treat my sweet mama. She does so much for so many. She deserves it! This would be a nice surprise for my wife who does so much for the family. I would love to surprise my sister with a special celebratory treat. She recently earned her realtors license. My Dad loves sweets. I would surprise him! I would surprise my good friend, Dee. She is such a caring person – always doing special things for other people. It would be so much fun to do something for her! I would like to surprise my kids’ teacher. My mom could really use a pick me up she has been having some rough times. My daughter is coming up on her 20 anniversary from having Cancer when she was 7 she would love it donuts too are her favorite treat! I would love to surprise my momma she’s such a hard worker and deserves a yummy treat!! This is a great idea!! 🙂 I would love to surprise my Vet and his staff who do a great job with all my pets. They really are wonderful and I know they would love to get a gift like this. I would love to surprise my Mom with a gift, she is very special to me. I would love to give a gift to my BFF! She is amazing and such a great mom who could use a pick me up! I would like to surprise my husband he is such a great guy never complains about anything and he has been married to me for 28 years so bless his heart? I would like to surprise my mom with some treats. I would love to surprise my husband on his birthday in one week! He loves pastries and this would be a creative way to give him some instead of a plain brown box. I love this idea! I’d gift this to my husband. 🙂 He works hard all day and could use a surprise. I’d love to surprise my daughter’s teachers. Such a fun idea! I would love to surprise my Dad’s lovely neighbor Kelly. He recently moved back home after a long recovery at my house following surgery and she has been a godsend checking in on him every day so I don’t always have to make two trips across town to help him with meals. I would love to surprise my mother because she is so awesome and very giving. In addition, she loves sweets. I’d like to surprise my next door neighbor. He is an older man who just had surgery. I’d love to surprise my nieces and nephews with a treat! I’d love to surprise my sister. I would love to surprise my mom with something special because shes always there for me when i need her the most and that her birthday is next month 🙂 Thanks for the chance! I would love to surprise my daughter. She has been working so hard in school and on her art, as well as holding down a part-time job. She is so responsible and kind and such a joy to be around. I want to do something special just to let her know she is appreciated. I would surprise my mom. I had an incredible childhood and she is STILL my rock and my best friend. I would love to surprise my mom. She is such an amazing lady. I’d love to surprise my husband with one. He is such a hard worker! I would love to surprise my aunt! She was recently in an accident and could use a pick me up! I would love to surprise my mom! She would love it! I’d love to surprise my husband with a thank you gift like this! He works hard and deserves some recognition. I’d surprise my daughter…she just moved into her first apartment and I’d like to bring her some goodies! I will surprise my son, he’s almost finished getting his master’s in special education. Kid-wrangler, cat-lover, and often reluctant director of this crazy cruise, discovering ways to make mom life the best life! Family travel and caffeine give me life.